So far, we’ve covered Attraction, Authority, and Affinity content. Now it’s time to turn your fans into customers with Action content. And this is where all the work you’ve done as a content marketer starts translating into revenue for yourself, your clients, or your organization. 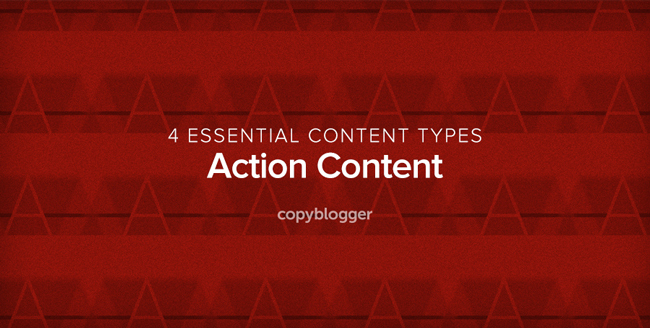 The good news is that Action content is probably the easiest type of content to understand. But the bad news is that it can also be some of the most difficult to produce. Action content is content designed to get somebody to take an action. How about that for easy? Content marketing is a new kid on the block in some ways, surging in popularity in the last five years. In other ways, content marketing has been paired with advertising for quite some time. Take John Deere’s 118-year-old magazine, The Furrow, as an example. The Michelin Guide, first published in 1900, is another great example of classic content marketing. However, what I’m talking about here is the marriage between copywriting and content marketing. A marriage between copywriting and content marketing helps you attract attention, increase engagement, and then ultimately, persuade someone to take action. Naturally, you’ll want to start off with small requests. Get people used to taking your advice and following your instructions. You get people to warm up to you and trust you — step by step — until the sale, and then the repeat sale or the recurring sale. Let’s look at some successful pieces of Action content. The most obvious piece of Action content you will create is promotional — sales copy that you publish and run for the duration of the offer. After the sale is over, we recommend you remove the post from your site. Action content also includes landing pages, like this one on content marketing that encourages visitors to register for Copyblogger’s content library. 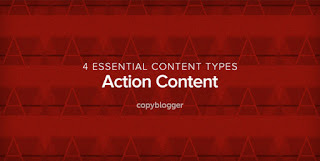 In addition to those two cases, your best content will combine all four types of “A” content. Here’s a stellar example: What’s the Difference Between Content Marketing and Copywriting? It’s authoritative. Sonia Simone’s years of working in the copywriting and content marketing world turned what could have been a shallow answer into an extended clinic in effective writing. It takes a stand. The content exposes people to one of our core philosophies at Copyblogger: Really good content is unsurpassed at building rapport, delivering a sales message without feeling “salesy,” and getting potential customers to stick around. It’s laced with action. You might not see it at first blush, but this piece of content motivates readers to check out the educational resources Copyblogger has to offer — from the My.Copyblogger free membership site to the paid offers like Authority and Content Marketing Certification. The success of this content wasn’t accidental. There was a plan: the content primes people for when we actually do make an offer. Writing something interesting to fill space and keep people reading won’t cut it here. You need to pair your content with a business goal. What is the action I want my audience to take? Now, getting people to actually take that action requires some skill. Like I said above, this is the hardest type of content to master. It takes time to learn copywriting skills, and it also takes time to master them. Once you’ve worked through that list, the next best thing you can do is to practice. Write. Then write some more. And on that note, let me close with a little encouragement. When I first got into copywriting, I threw myself into it whole hog. I devoured every book I could get my hands on. Tore through successful promotional pieces. Listened to a legion of cassette tapes on the art of direct response copywriting, human psychology, and negotiations — yeah, this was way before podcasts. Wrote a mountain of sales letters, emails, and text ads (and then watched mentors tear them apart). This went on for years. I thought I knew my stuff. However, it wasn’t until about Year Five when things clicked … when I turned the corner and all that head knowledge became heart knowledge. The moral of this short story is that if I can learn how to write Action content, so can you. But it’s going to take time. Don’t expect too much of yourself too soon. Just start learning, publishing content, measuring results, adjusting, asking for feedback, and so on. What’s your favorite example of Action content? Drop us a note in the comments section below to share your thoughts.